Woocommerce Marketplace Daily Deals plugin for managing products in daily deals section with flat or percentage based discount. Vendor can schedule marketplace daily deals according to their time and needs. Vendor can select individual or category wise products for daily deals. 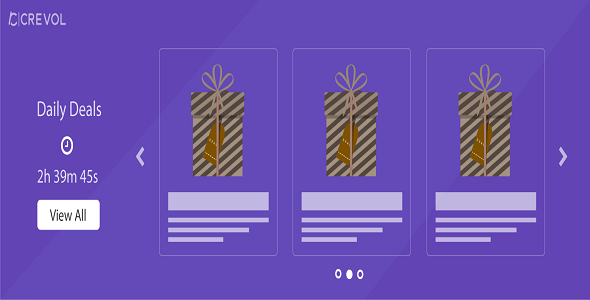 Woocommerce Marketplace Daily Deals plugin contains other features for products carousel and tag name and font setting. This plugin will only work with our Multivendor Woocommerce Marketplace. In this plugin vendor can set single or multiple products in carousel as well as widget too. Vendor can set category wise products with feature of single product. seller have option to set two types of discount, Flat and percent based and change discount on accordingly. Time schedule option is there, where vendor can schedule time for deals. Vendor can enable or disable their deal. Countdown timer will be displayed with your marketplace daily deals carousel. When will deal’s time complete. All products will reset with old price automatically. Admin can set carousel any number of time and widget too. Administrator can set deals title and tag text which will be visible to end user. Admin can approve or unapproved, edit and delete vendors deal. A whole list of vendor can reveiwd by administrator. There are also some other features like change text color, background color, button color etc.